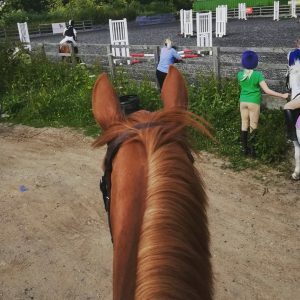 Horsey Stuff • Our Progress1 Year on from Disaster! 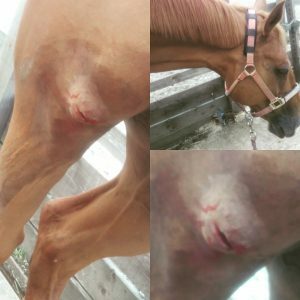 On the 5th of August 2017, I received the phone call no horse owner wants to get. Disaster had struck. Scottie had gotten a nasty injury in the field, was currently standing there not able to weight bare and needed the vet ASAP. Luckily I was already on my way back from Colchester when I received the call, so I raced home in time to help get him in from the field just in time for my vet to arrive. Luckily we had just missed the important and complicated structures of the stifle and just missed his kneecap. But the wound had gone down to the bone and was very nasty. However, Scottie being the superstar he is, quickly made good progress going from 9/10 lame to 1-2/10 lame in just over a week. It was at this time that our vet was sure he would make a full recovery. However, due to Scottie’s determination to escape his pen and the wound taking a bit longer to heal than the vet thought it should be, Scottie spent a night at the horse hospital to have lots of tests done to rule out any complications which had been missed. Luckily, there was nothing serious, there had just been more damage to the muscle than our vet originally thought, largely due to how quickly Scottie improved. Towards the end of September we were given the all clear to start getting back on. Starting with 35-40 mins ridden every day for 2 weeks and then adding an extra 5 mins each week. Once we were up to 20 mins of trotting a day we were okay to carry on as usual. Despite a minor set back towards the end of October, where Scottie got a little excited in the field and thrown in some pretty impressive acrobatics, we were back to riding as usual by the end of November/beginning of December. We even managed to film an Intro test for EquiMind’s November competition. After having such a disastrous end to last year, I kick started this year fairly well I think. We had several lessons quite early on and I couldn’t believe how much of an improvement there was in Scottie despite his injury. What was even more surprising is when he had his back done at the start of the year and for the first time ever, he didn’t need any treatment! He has recently had his back checked again and once again has been given the all clear! 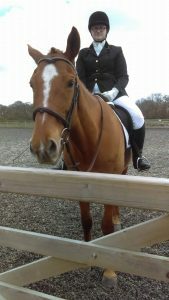 We went to our first dressage show of the year early on and I was really pleased with how he went. While I haven’t managed to get him out a huge amount more since this, I feel like we have achieved a lot of other things. 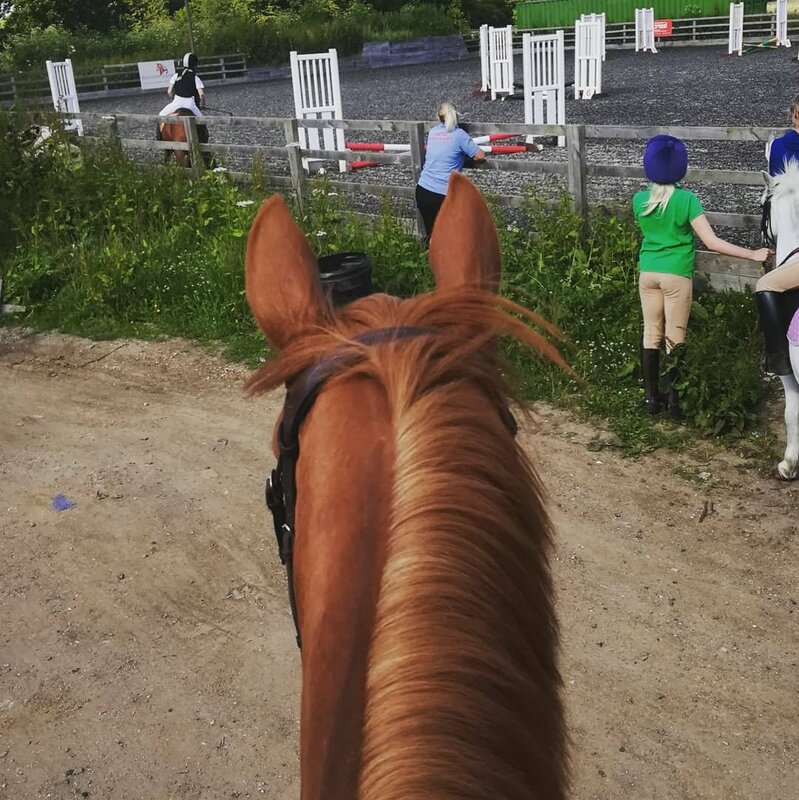 Our flatwork has improved massively, largely thanks to some really key lessons. But we have also started jumping again, heading back to the cross country course for a lesson and even qualifying for our local show jumping championship! 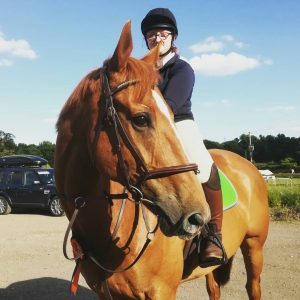 I am hoping to pack in a few more dressage and show jumping shows before the season ends. But we are definitely in a much better place now and if we don’t quite manage what I would like to achieve this year, I know that we will be more than ready to crack on and achieve a lot more next year!